When planning my posts for December I have also been thinking about what post would be suitable for this last day of 2013. I had planned all of my reviews and roundups and I had decided not to make my 'Beauty Empties' post on the last day of the month like I usually do. In fact I wanted to come up with something more special and festive. At first I wanted to write a post about New Year's resolutions, either personal ones or blogging resolutions. However I am someone who always exaggerates with resolutions and who mostly resolves to be a whole new person. That doesn't mean that I don't like who I am or how I live, it just shows how aspiring I tend to be. When it comes to blogging resolutions I read a few really helpful articles (check out IFB!) which were so good that I really had nothing to add. After a while it came to my mind that 2013 had been a great year when it comes to meeting other bloggers and attending my first blogger events. Therefor I wanted to make use of this last day of the year, to thank those bloggers who have become good friends of mine, who have been a source of inspiration for me, who have always been supporting me or who have just touched me in some way or another. Anne is a fellow Luxembourgish blogger who is being successful with her own cookbook and TV show. This summer I went to an event where she released and signed her book and while she signed my copy I couldn't keep quiet about my own little blog. Funnily enough she started to stop by my blog from time to time so she immediately recognized me when we met at a book fair this autumn. Last week we finally met privately and it was really lovely talking to her, learnig about her live in London and hearing what she thinks about blogging. Even though she doesn't live in Luxembourg anymore she's really interested in the Luxembourgish blogging scene (as far as it exists) and I would love to set off a few projects with her next year. Anne, thanks for being such a lovely person! Besides from my live in Luxembourg I also have one in Bonn, Germany where I study. Since the beginning I wanted to get in contact with like-minded people over there but somehow it's harder to get to know other bloggers than one might think. This spring Jana, who is definitely one of the most known Bonn bloggers as her blog is all about our beautiful city, found some local bloggers on Instagram, me included. We founded a Facebook group for us local bloggers and in December we already had our 4th blogger meet-up. I can wait to meet her and the other girls again asap and I'm sure we will have some more fun moments together. One of the other Bonn bloggers is Daria whom I have only known for a few weeks. However we went to the Primark store opening together and I found it really inspiring hearing about her blogging experiences. We even planned to go to Berlin Fashion Week together in summer which for me would be a dream coming true! 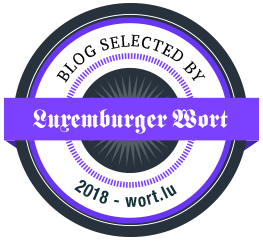 From the local German bloggers back to the local Luxembourgish bloggers. Anouka is one of the few Luxembourgish bloggers who updates her blog regularly and who gives interesting updates on life in Luxembourg. Unfortunately I haven't been able to meet her in person but I would love to in 2014. I put these two girls together because what they have in common is to comment on each and every post on my blog and that for a long time already. That really needs honouring! Another faithful supporter of my blog. She has been my first GFC reader and still comments on my posts regularly after over two years! These two girls really deserve to be on this list as well but not so much for what they have done for me in the classical meaning but for their gorgeous style that inspires me over and over again. The blogs I like change from month to month but this year I really remember those two being my source of inspiration when it comes to blog design, outfits and photography. Last but not least I wanted to generally thank the other Bonn blogger girls, especially those whom I have been able to meet in person, and the bloggers from the MyStyleHit forum, especially those who organized the Blogging Advent calendar with me. It has been a lovely year of blogging thanks to all of these people but also thanks to those who read and comment. I know that there are many more people who comment on my blog regularly but unfortunately I couldn't mention all of you. If you know you are a regular reader then my gratefulness goes to you as well. And now it's time for all of us to switch off our computers, get ready for tonight and celebrate the last and the next year. Have fun guys, I see you in 2014! Thank you for mentioning me Carmen! I would love to meet you as well in 2014 - it's going to be our objective and I'm sure we'll find the right place and time to do it. Already looking forward to it! ;) E gudde Rutsch, xo. Carmen, this is a really sweet post! So very thoughtful of you. I follow Call Me Maddie. She's really cool. I'll be sure to pay a visit to the other bloggers as well. Very nice. You are the sweetest Carmen, thanks for the kind mention! By the way, it's Anne of Anne's Kitchen - somehow my Google account is linked to a super old blog of mine (which I had 6 years ago! ), so excuse the strange username!